Meet Meatball: The adorable pit bull mix that can't help but flash his pearly whites when he sees a camera. His owner, Lisa Reilly, tells ABC News, "As soon as the camera turns on he just gets this huge grin on his face. It cracks me up!" His toothy grin and big personality has amassed quite a few fans on Instagram, now with more than 35,000 followers. 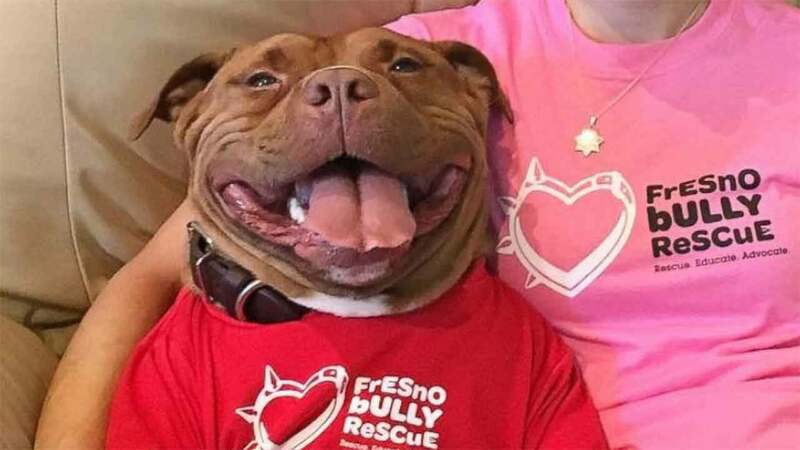 Meatball caught Reilly's attention two years ago in a picture, which led her to adopt him from Fresno Bully Rescue. She says it was Meatball's signature physique that originally inspired his name. "He literally just looks like meatball," Reilly said. "He has no neck and he has no waist." Only 14 inches tall and weighing in at 70 pounds, it's no surprise Reilly said Meatball is never one to miss a meal. But it's his love of food that gets him to flash that million dollar smile in front of the camera. "As soon as the treats come out, he just goes crazy," Reilly said. "And any time the camera's on, he knows he's getting food." Whatever it is that gets him smiling, people can't get enough of Meaty's hilarious photos. Reilly agrees. "I just don't know how you could not laugh every time he's around!" she said.